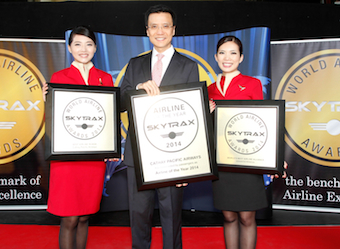 Cathay Pacific Airways is the best airline in the world for 2014, having moved five places up the Skytrax 2014 World Airline Awards top 10 list since last year. Malaysia Airlines comes in at 18th best in the world despite recent tragedies. The World Airline Customer Survey surveyed 18.85 million business and leisure travellers across all cabin travel types (first, business, premium economy and economy) between August 2013 and May 2014. The survey covered more than 105 participant nationalities and more than 245 airlines, from large international airlines to smaller domestic carriers, measuring standards across 41 key performance indicators of airline front-end product and service. Last year’s winner Emirates dropped three places to fourth place, while 2011 and 2012 winner Qatar Airways came in at second place this year. Cathay Pacific is the only airline to have reached the number one spot four times, in 2003, 2005, 2009 and 2014. Skytrax chief executive officer Edward Plaisted said Cathay Pacific Airways was the best performer across all types of travel. AirAsia was named the world’s best low-cost airline for the sixth year in a row. AirAsia Group chief executive officer Tony Fernandes said guests’ valuable criticisms and feedback contributed to the company’s success.